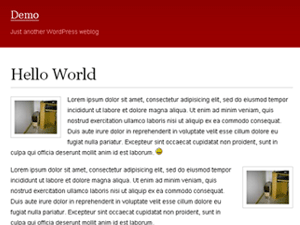 Description: A 1-column to 3 column hybrid, widget-ready theme. I made it! 3 minutes until my deadline to publish a WordPress theme for today. The red, black, and white color scheme first got me on the WordPress theme designers map with Neo-Sapien. Now, I’m coming back with the same color scheme for Vengeance. I wanted to do more with this theme, like title listings in the red header and fluid width. However, I got frustrated and sleepy.